Some of the agencies have quite strong presence on social media (sm), but surprisingly majority of the biggest media agencies haven’t developed these capabilities yet. Even if they exist they are much uncoordinated and not very well marketed. It doesn’t seem like some of the media agencies have clear strategies yet how to integrate social media into their businesses. Updates about awards and general news. Mainly very self orientated content. Almost none of the agencies in Europe are trying to use their multinational benefit in terms of content creation and there is a clear shortage of such kind of content. No clear differentiation or positioning in terms of content. The social influence and reach of the top media companies on social media properties are rather week compare to social media agencies or even some personal brands, mainly because no community building strategies are implemented and it is mainly used just as an automated channel to send the updates about previous campaigns without any engagement with partners or clients on social media. An interesting fact is that some of the technology companies, social media agencies or personal brands write much more about the media and have much bigger influence on the subject than the companies who know everything about the media. The sharing functionalities and community building tools not really integrated in most of the top media agencies websites. Surprisingly, even companies who have blogs within corporate websites, make sharing and joining the communities so difficult that for a regular person it could be easier just to close the page instead of trying to find these features. Well it’s my short overview of social media adoption in top media agencies, I bet if we dig deeper there would be even more interesting findings available. I just want to note that it was a personal research done in very short period of time so some of the results maybe a bitt different as Media/PR/AD agencies’ market is quite complex and quite often overlapping. 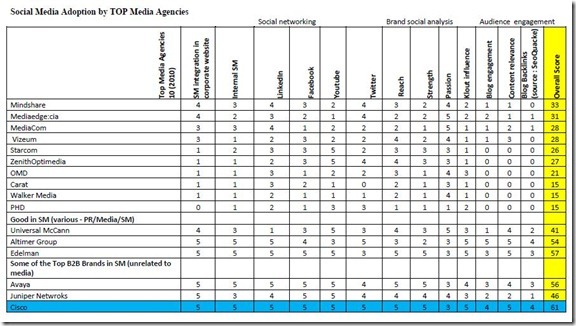 I guess some of the social media agencies probably would get a higher score as they have got multiple social accounts and the strength of these accounts is quite significant. 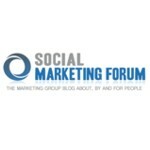 « Social Media Strategies: Is Social Media Adoption The New Quality Standard Of Successful Company?